For a long time it was thought that it was not possible to operate a conventional phone-line beyond low-speed limits (typically under 9600 bit/s). In the 1950s, ordinary twisted-pair telephone-cable often carried four megahertz (MHz) television signals between studios, suggesting that such lines would allow transmitting many megabits per second. One such circuit in the UK ran some ten miles (16 km) between the BBC studios in Newcastle-upon-Tyne and the Pontop Pike transmitting station. It was able to give the studios a low quality cue feed but not one suitable for transmission. However, these cables had other impairments besides Gaussian noise, preventing such rates from becoming practical in the field. The 1980s saw the development of techniques for broadband communications that allowed the limit to be greatly extended. A patent was filed in 1979 for the use of existing telephone wires for both telephones and data terminals that were connected to a remote computer via a digital data carrier system. The motivation for digital subscriber line technology was the Integrated Services Digital Network (ISDN) specification proposed in 1984 by the CCITT (now ITU-T) as part of Recommendation I.120, later reused as ISDN Digital Subscriber Line (IDSL). Employees at Bellcore (now Telcordia Technologies) developed Asymmetric Digital Subscriber Line (ADSL) by placing wide-band digital signals above the existing baseband analog voice signal carried between telephone company telephone exchanges and customers on conventional twisted pair cabling facilities, and filed a patent in 1988. By 2012 some carriers in the United States reported that DSL remote terminals with fiber backhaul are replacing older ADSL systems. Most residential and small-office DSL implementations reserve low frequencies for POTS, so that (with suitable filters and/or splitters) the existing voice service continues to operate independent of the DSL service. Thus POTS-based communications, including fax machines and analog modems, can share the wires with DSL. Only one DSL modem can use the subscriber line at a time. 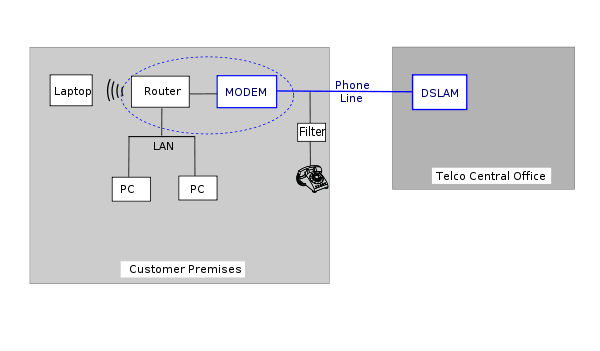 The standard way to let multiple computers share a DSL connection uses a router that establishes a connection between the DSL modem and a local Ethernet, Powerline, or Wi-Fi network on the customer's premises. It is also commonly called a "UNE" (for Unbundled Network Element) in the United States; in Australia it is known as a "ULL" (Unconditioned Local Loop); in Belgium it is known as "Raw Copper" and in Turkey it's known as "Yalın Internet". It started making a comeback in the United States in 2004 when Qwest started offering it, closely followed by Speakeasy. As a result of AT&T's merger with SBC, and Verizon's merger with MCI, those telephone companies have an obligation to offer naked DSL to consumers. In Turkey, since 2011, telephone companies are obliged to offer naked DSL as a result of consumer pressure to the regulatory bodies, however companies can incur additional fees under various label, such as circuit preparation service (devre hazırlama ücreti) or an additional naked DSL fee (yalın adsl ücreti). Although circuit preparation service fee is one-time, the latter is recurring and can constitute as much as 20% of the monthly bill. 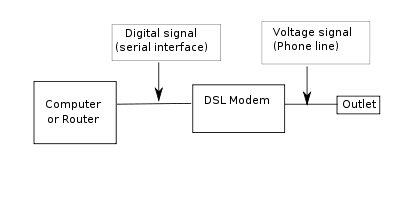 The accompanying figure is a schematic of a simple DSL connection (in blue). The right side shows a DSLAM residing in the telephone company's central office. The left side shows the customer premises equipment with an optional router. This router manages a local area network (LAN) off of which are connected some number of PCs. With many service providers, the customer may opt for a modem which contains a wireless router. This option (within the dashed bubble) often simplifies the connection. The customer end of the connection consists of a terminal adaptor or "DSL modem". This converts data between the digital signals used by computers and the voltage signal of a suitable frequency range which is then applied to the phone line. In some DSL variations (for example, HDSL), the terminal adapter connects directly to the computer via a serial interface, using protocols such as ethernet or V.35. In other cases (particularly ADSL), it is common for the customer equipment to be integrated with higher level functionality, such as routing, firewalling, or other application-specific hardware and software. In this case, the equipment is referred to as a "gateway". Most DSL technologies require installation of appropriate filters to separate, or "split", the DSL signal from the low-frequency voice signal. The separation can take place either at the demarcation point, or with filters installed at the telephone outlets inside the customer premises. Each way has its practical and economic limitations. The DSL transceiver performs a self-test. The DSL transceiver then attempts to synchronize with the DSLAM. Data can only come into the computer when the DSLAM and the modem are synchronized. The synchronization process is relatively quick (in the range of seconds) but is very complex, involving extensive tests that allow both sides of the connection to optimize the performance according to the characteristics of the line in use. External, or standalone modem units have an indicator labeled "CD", "DSL", or "LINK", which can be used to tell if the modem is synchronized. During synchronization the light flashes; when synchronized, the light stays lit, usually with a green color. The DSL transceiver checks the connection between the DSL transceiver and the computer. For residential variations of DSL, this is usually the Ethernet (RJ-45) port or a USB port; in rare models, a FireWire port is used. Older DSL modems sported a native ATM interface (usually, a 25 Mbit/s serial interface). Also, some variations of DSL (such as SDSL) use synchronous serial connections. Modern DSL gateways have more functionality and usually go through an initialization procedure very similar to a PC boot up. 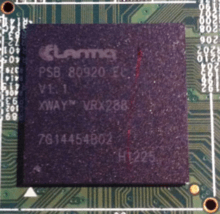 The system image is loaded from the flash memory; the system boots, synchronizes the DSL connection and establishes the IP connection between the local network and the service provider, using protocols such as DHCP or PPPoE. (According to a 2007 book, the PPPoE method far outweighed DHCP in terms of deployment on DSL lines, and PAP was the predominant form of subscriber authentication used in such circumstances.) The system image can usually be updated to correct bugs, or to add new functionality. John Cioffi - Known as "the father of DSL"
↑ John E. Trombly; John D. Foulkes; David K. Worthington (May 18, 1982). "Audio and full duplex digital data carrier system". US Patent 4,330,687 (published March 14, 1979). ↑ Ronald Shamus. "EE535 Homework 3". Worcester Polytechnic Institute. Retrieved September 15, 2011. ↑ Richard D. Gitlin; Sailesh K. Rao; Jean-Jacques Werner; Nicholas Zervos (May 8, 1990). "Method and apparatus for wideband transmission of digital signals between, for example, a telephone central office and customer premises". US Patent 4,924,492. ↑ Joseph W. Lechleider (August 1991). "High Bit Rate Digital Subscriber Lines: A Review of HDSL Progress" (fee required). IEEE Journal on Selected Areas in Communications. 9 (6): 769–784. doi:10.1109/49.93088. ↑ ULL (Unconditioned Local Loop). Whirlpool.net.au. Retrieved on 2013-09-18. ↑ Verizon MCI merger Archived copy at WebCite (July 14, 2007). ↑ ARU, ÇAĞDAŞ. "BTK Yalın ADSL Konusunda Düzeltme Yayınladı, Rekabet Kurumu Dünkü Açıklaması Nedeniyle Özür Diledi". Retrieved 15 February 2015. ↑ "İnternet kullanımının yaygınlaşması için tek çözüm "Yalın ADSL"". Retrieved 15 February 2015. ↑ "YALIN ADSL VERGİSİZ 8,13 TL OLDU AMA KİMSE BTK KARARINDAN MEMNUN DEĞİL". Telkoder. Retrieved 15 February 2015. ↑ "Yalın ADSL Fiyatları El Yakıyor". On5yirmi5. Retrieved 15 February 2015. ↑ "TELKODER'den Yalın ADSL açıklaması". Hürriyet. A.A. Retrieved 15 February 2015. ↑ Philip Golden; Hervé Dedieu; Krista S. Jacobsen (2007). Implementation and Applications of DSL Technology. Taylor & Francis. p. 479. ISBN 978-1-4200-1307-8. ↑ "New ITU broadband standard fast-tracks route to 1 Gbit/s". ITU-T. 2013-12-11. Retrieved 2014-02-13. ↑ Spruyt, Paul; Vanhastel, Stefaan (2013-07-04). "The Numbers are in: Vectoring 2.0 Makes G.fast Faster". TechZine. Alcatel Lucent. Retrieved 2014-02-13. ↑ "G.fast broadband standard approved and on the market". ITU-T. 2014-12-05. Retrieved 2014-12-07. ↑ Hardy, Stephen (2014-10-22). "G.fast ONT available early next year says Alcatel-Lucent". lightwaveonline.com. Retrieved 2014-10-23. ↑ "IPSL Special Interest Group". consortium web site. 2007. Archived from the original on September 28, 2008. Retrieved September 15, 2011. ↑ "Rim Semiconductor Company". official web site. Archived from the original on August 24, 2008. Retrieved September 15, 2011. ↑ Matsumoto, Craig (2005-09-13). "Valley Wonk: DSL Man". Light Reading. Retrieved 2014-02-19.